Home » Retirement Planning » How Much House Do I Need? According to the US Census Bureau, the average size of the American home has doubled since the 1950s and increased over 60 percent since the 1970s. So one thing is clear: our houses are getting bigger. But how much house does a person truly need, especially as you plan for where you’ll live during your retirement years? We have four factors to consider when you are trying to decide if your current house is adequate or if you need to upgrade or downgrade, along with a look at the benefits of a large house and a smaller one. When you’re deciding how much house you need, remember that your life now most certainly won’t be your life in retirement. Is there a chance you’ll be taking care of an aging family member who has to move in with you? Is your monthly income going to reduce so much in retirement that you can’t afford your house? Are chances good that you will need modifications to a home for your mobility? Retirement brings changes, and those changes will have a direct impact on your housing situation. Will You Be The Family Host? Another factor to consider when thinking about the size of house you’ll need is how often you’ll have people at your home, whether permanently or visiting for a short period of time. Do you plan on throwing parties and entertaining often? Will your house be the hub of activity during holidays and birthday parties? If so, you’ll want to make sure your home has plenty of seating room and a spacious kitchen. You’ll also need to think about your family. Do you have far-flung relatives who will visit throughout the year and will need a place to stay or does your family live nearby? For some people, a house isn’t “home” without family continually visiting. For others, the occasional holiday visit is acceptable. Decide which side you’re on when you think about how much house you’ll need. If you think having a bigger house means more space you can put to good use, you might reconsider. According to a study from the Center on Everyday Lives of Families at the University of California Los Angeles, we spend the majority of our time in just a few areas of our homes. The study looked at 32 middle-class families over four years. 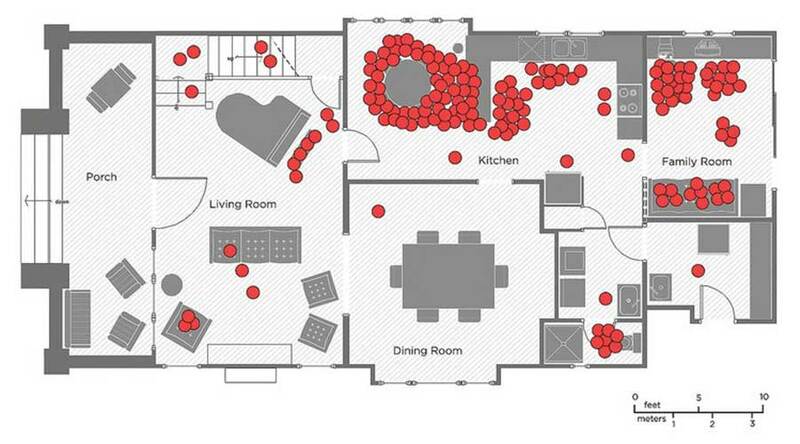 The graphic below (published by the University of California Los Angeles) shows where one of the families spent most of their time. Their house has a separate living room and formal dining room. It also has space for a piano, a laundry room and a rather large front porch. Even though this graphic represents one family, the study showed that 68 percent of family’s time is spent in the kitchen and living or family room where a TV is located. Remember that with a larger house comes a larger commitment to maintenance – a commitment of both time and money. A general rule when it comes to home maintenance is the one percent rule. Take the value of your home and budget one percent of that amount for maintenance costs each year. Another rule, the one dollar rule, suggests estimating about one dollar for every square foot of your home for annual home maintenance. Of course, you won’t spend that amount every year, but this is what you should plan for over time, especially with the chance that you will need some new appliances. Considering that the average American spends 70 hours a year on just lawn maintenance, it’s easy to see that a larger home and yard is more costly beyond just paying the mortgage. As you plan for how much house you’ll need in retirement, think about the yard work and repairs that go along with a home. If this isn’t a concern, then a larger home is unlikely to be a burden. But if you want to put the mower away when you retire, you should probably plan to downgrade the size your living space. If you’re leaning toward downsizing your home for retirement, you are unlikely to feel deprived. A small home brings a number of benefits. Get rid of clutter: You can’t accumulate things when you don’t have space to store it. If one of your goals in retirement is to get rid of “stuff,” then a small home will help you achieve it. Costs less to operate: A smaller home means lower energy costs, less maintenance, and lower taxes, so if you’re looking to save money in retirement, this is a significant advantage. Encourages activity and interaction: In a large home, it is common for everyone to have their own space. But if you want to get away from the isolation and reinforce some family interaction, a small house will make that happen. Thinking big? 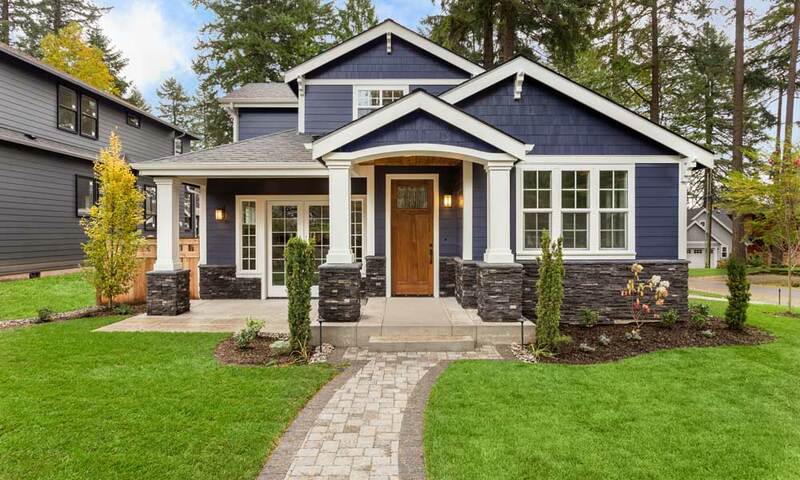 If you think you want more living space in retirement, a larger home has a lot of upside. Room for everyone: Whether you will need space for the grandkids to stay when they visit, for the kids to move back home after college (36 percent of college seniors do) or for everyone to gather around the Thanksgiving table, a larger home means you’ll have ample room for family. Easier to sell: You might not be planning to sell your home anytime soon, but a larger home is often much easier to sell on the real estate market than a larger one when that time comes. Most home buyers are looking for extra bedrooms and bathrooms, so keep this in mind if you think you may eventually sell. More opportunities: Many people pick up new hobbies in retirement, and that often means you’ll need more space for these activities. If you can see yourself trying new things, make sure you have room for supplies and anything else you’ll need. Remember that some hobbies can actually produce income. Since over half of retirees say they plan to work at least part-time after retirement, a new hobby can be an excellent source of income. There’s obviously no one size fits all approach to choosing a home size. Everybody’s family size, priorities, and approach to retirement is different. But as you approach retirement, it’s important to take a little time to consider how much space you will need in a home. 6 Tips For Financial Stability In Retirement How Much Money Do I Need to Retire? Senior Housing: What Does It Cost? How Much Social Security Will I Get?